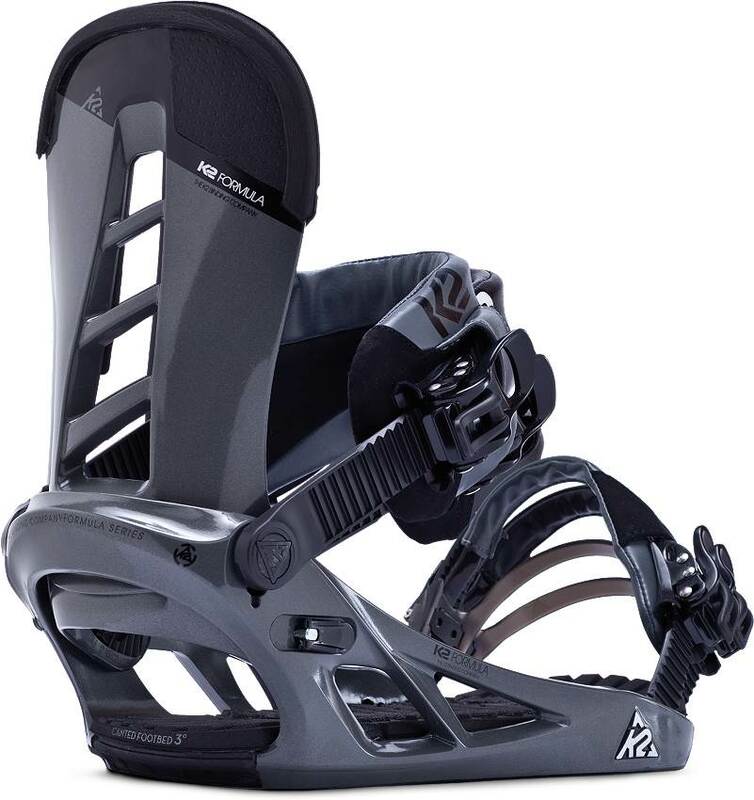 The K2 Formula Snowboard Binding is not even close to leading edge tech and it feels a little dead under foot but it’s very predictable, very functional and will last a long time. 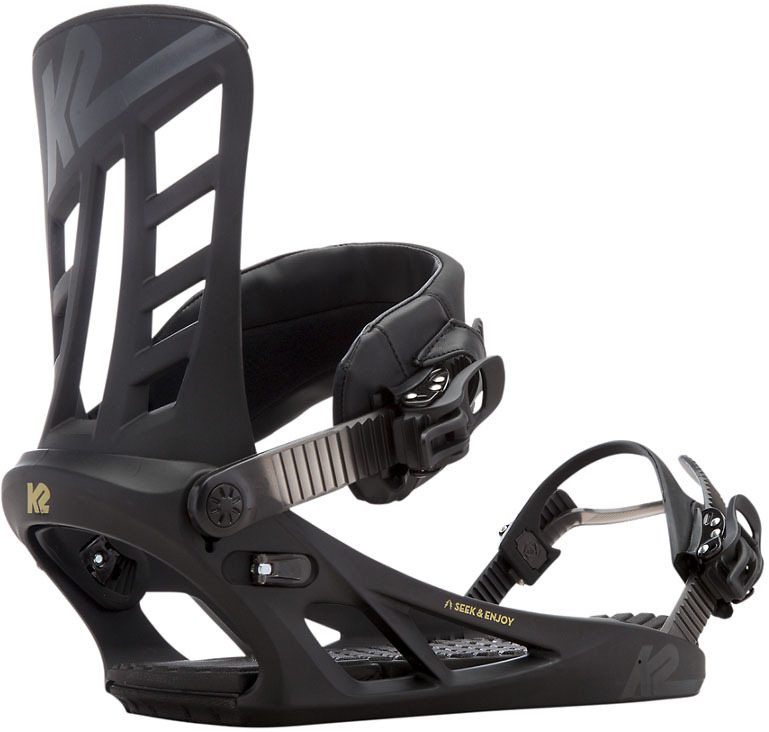 Boot Adjustability: The K2 Formula is pretty adjustable and it helps you fit your boots to the binding/board pretty well. Stance Width Adjustability: It’s got a cool disc that allows you to get your correct stance width with traditional inserts. Check the vid. Comfort: The ankle strap is super comfortable without being too unsupportive. Boot Support: The ankle strap allows you a nice balance between support and freedom of movement while still being comfortable. Turn Initiation: The toe ramp in the toe makes for a more responsive binding than you would think but it works. Buttering: Not very easy to butter. 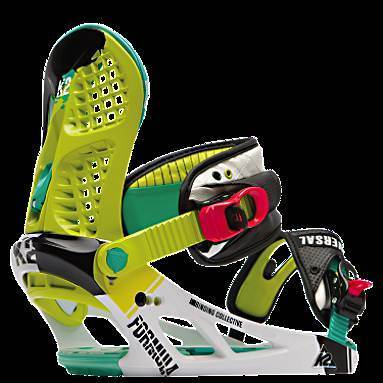 It makes the board feel stiffer underfoot which could be good to some but bad to most. Ratchet System: Smooth enough. Nothign special but nothing bad either. Shock Absorption: There is some shock absorbind foam in the heel but it’s not that great overall. I’ve ridden much worse and much better. So overall the binding is ok. Nothing great comes to mind to write about and there is nothing tragic either. 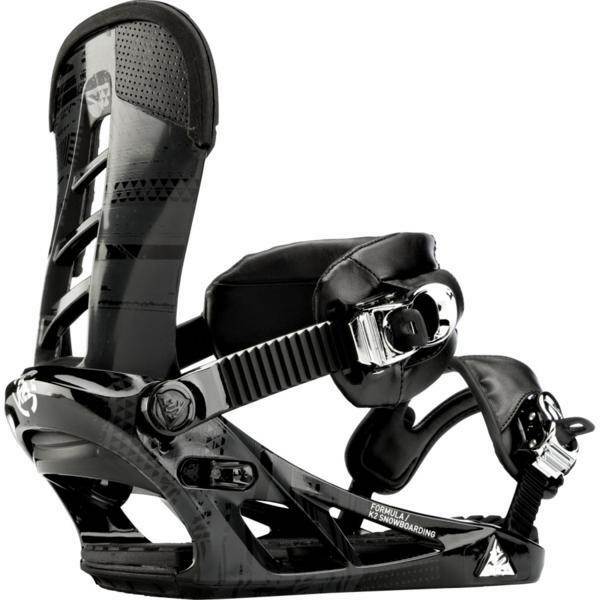 It’s just an old school binding that is reliable and in this day and age kind of unexciting even for this price point. But everything works and it’s construction is solid. 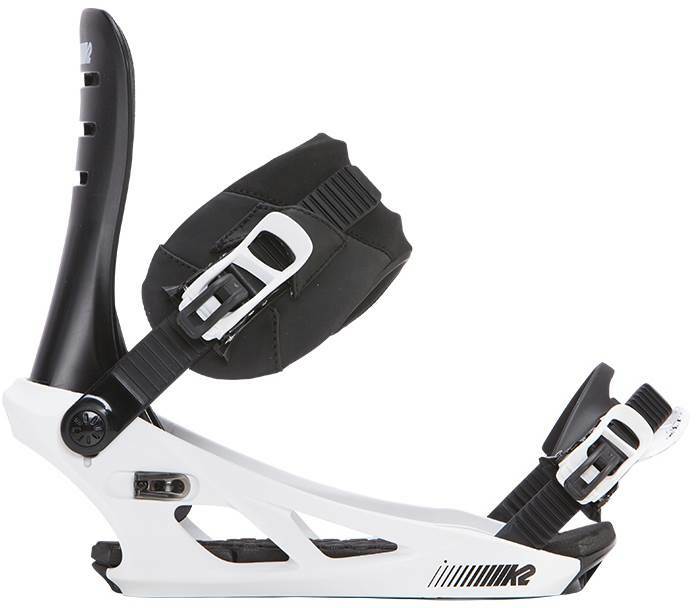 The 2014 and 2015 K2 Formula changed very little from last year and continues to be a good binding that can work for riders on a mid level budget. 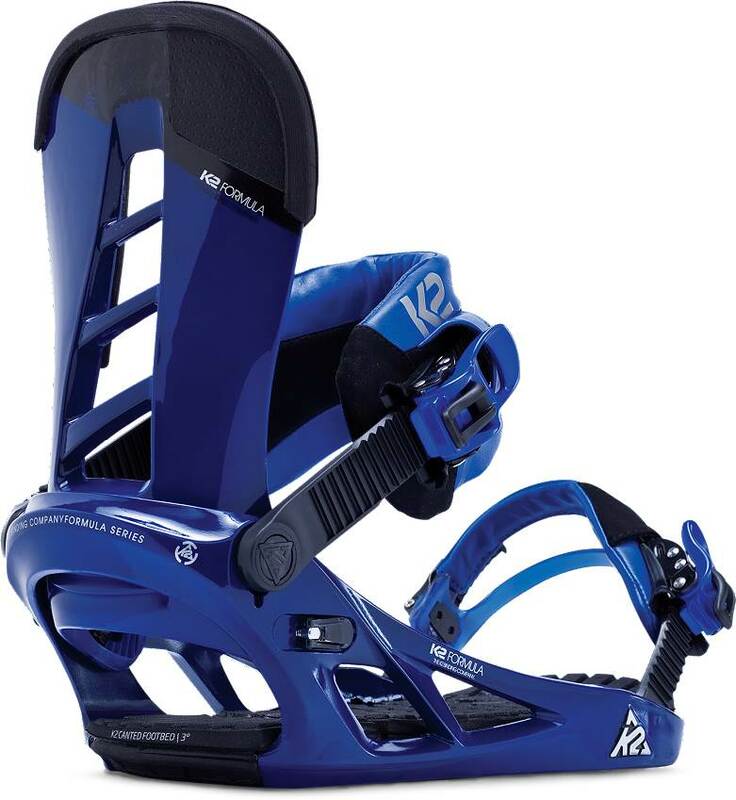 Adjustability: The K2 Formula has the same excellent adjustability as the higher end bindings like the IPO and Company. It’s super easy to dial out the ankle strap and toe strap exactly to your boot. Also high back rotation is tooless and pretty easy to adjust. Comfort: Most of us aren’t normally into this type of ankle strap which is kind of thick in the middle but it works and works well. 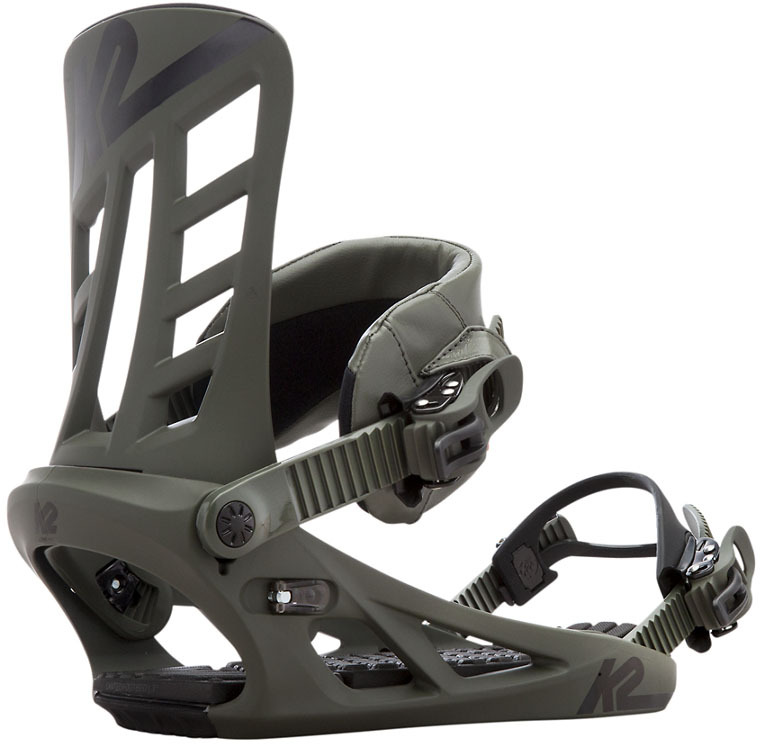 The whole binding integrates well with the boot and most won’t have pressure points. Heel-Toe Response: Pretty solid response edge to edge and you could pair the formula with pretty aggressive boards if you want. It’s best with more moderate turning boards but it can work with semi-challenging and easy turning boards as well depending on your preference. Tip-Tail Response: There isn’t much going on here when it comes to buttering or making the board flex lengthwise. 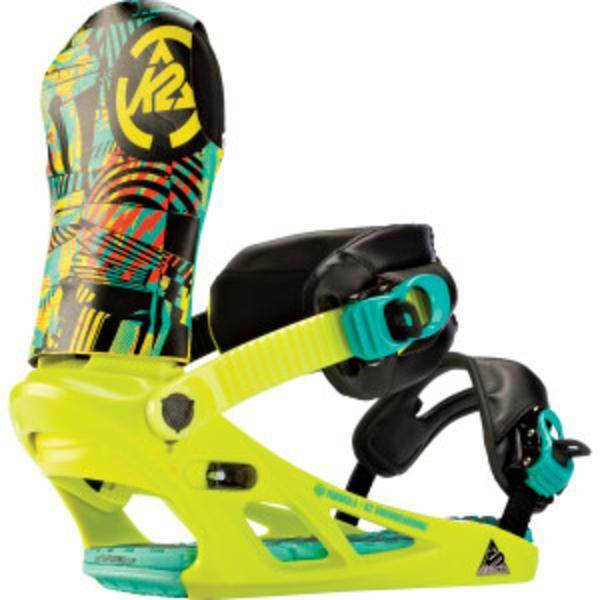 It’s got a lot of direct contact with the board that creates a dead spot underfoot. Still it’s fine with a softer board if you want to butter, press and what have you. 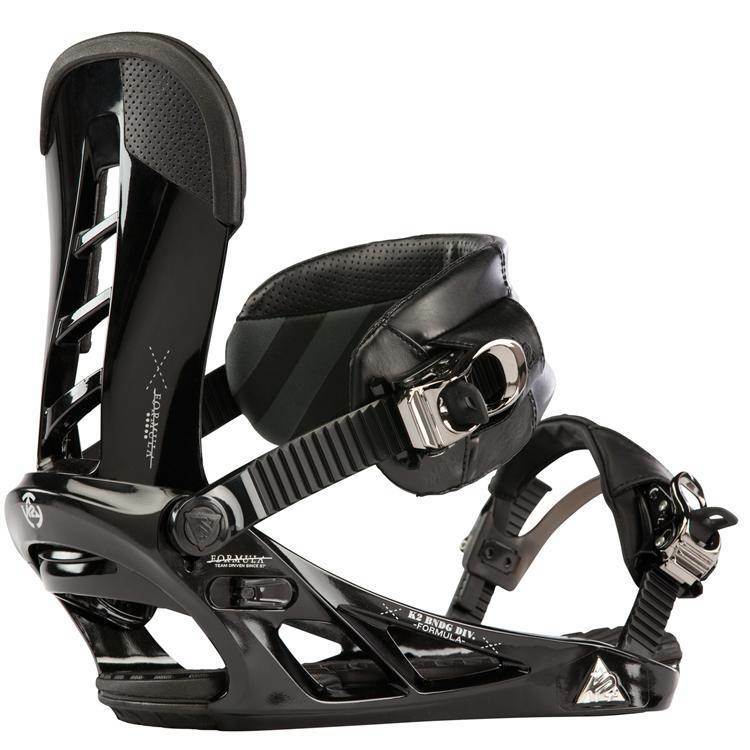 Boot Support: Your boot and ankle feels supported but it doesn’t have a super conforming grip around the ankle that some bindings have. Ratchet System: Not bad. I don’t think any of us really noticed any issues but at the same time noting called out to us on how quick and easy it is. Shock Absorption: There is a lot going in the heel and the canted foot bed is good for reducing ankle, knee and hip stress/fatigue. Pretty cushy. 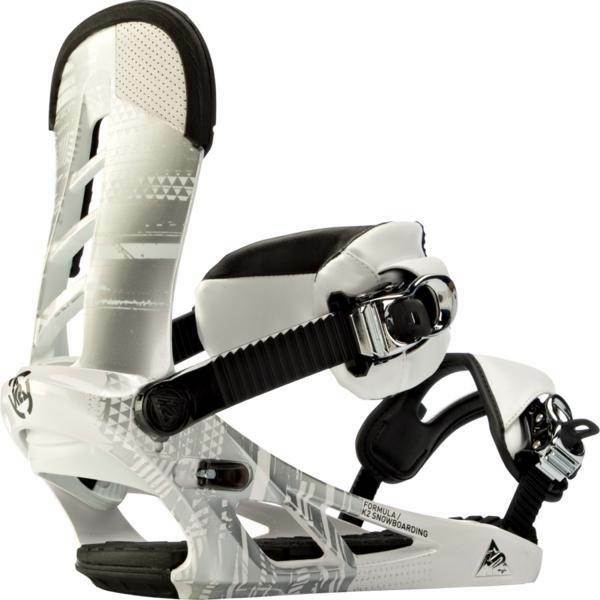 All in all this is a good binding that has a traditional feel with a few modern upgrades like a cant. 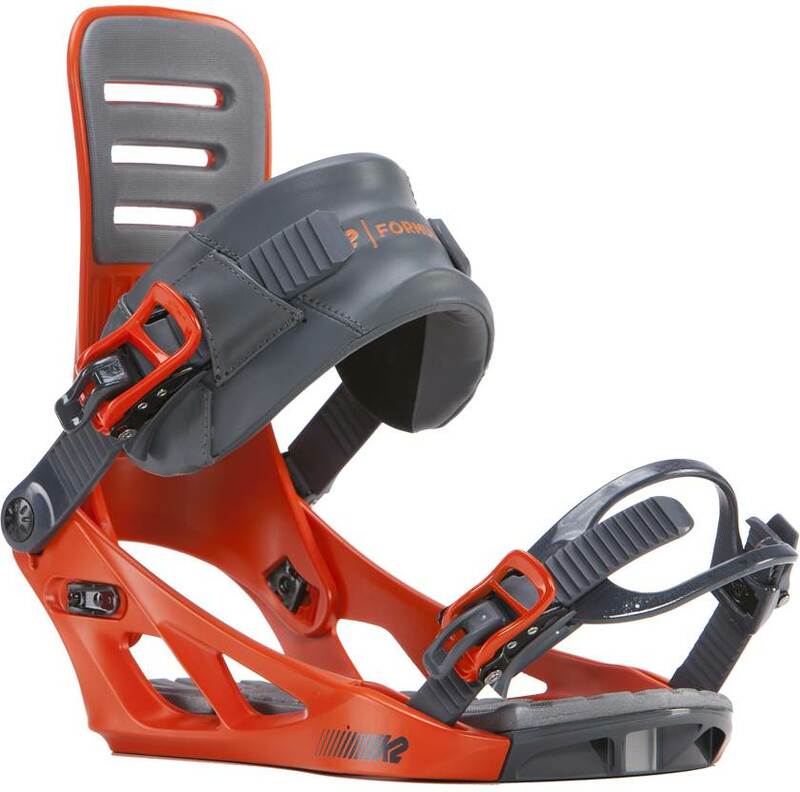 We’d like to see more flex under foot but still this is a pretty good binding for it’s price range. 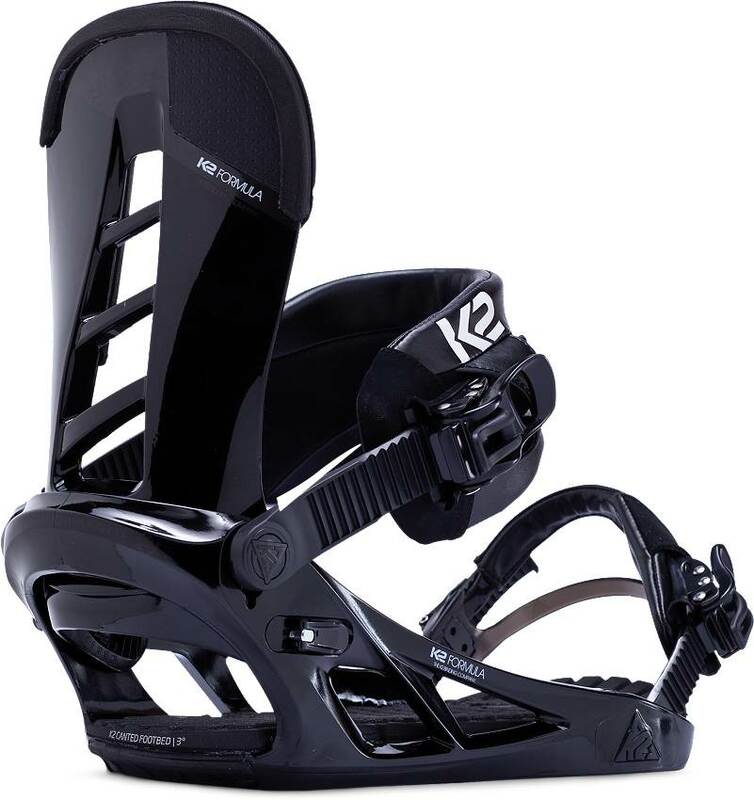 K2 made a big move when it came to the old Formulas vs. the new Formulas and if you are going to buy these we strongly suggest paying a little more for the 2011 models and up. Don’t mess around with the older models you might find on Craigslist or ebay. K2 changed out the old metal/plastic base plate to a complete plastic/fiberglass base plate. 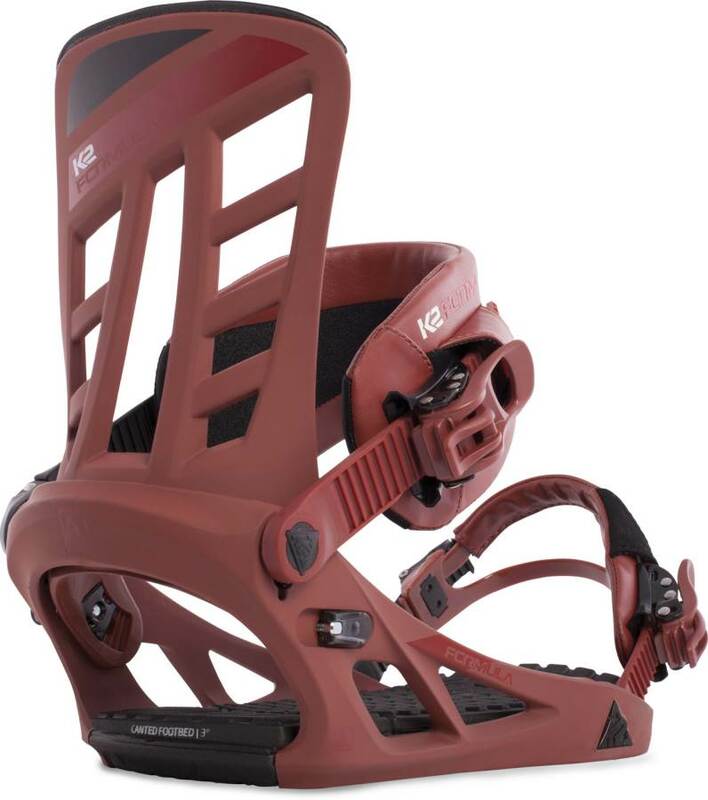 You no longer have to adjust a metal heel loop to fit your boot! 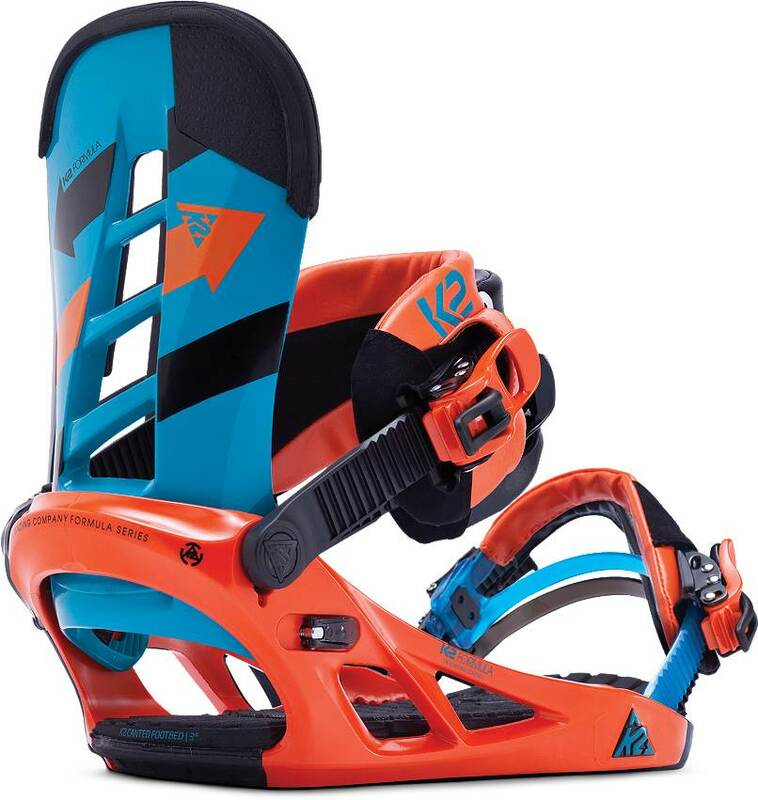 Well done These bindings went from a pain to a pleasure to set up and also added a lot more heel cushioning. It’s also easier on your top sheet. 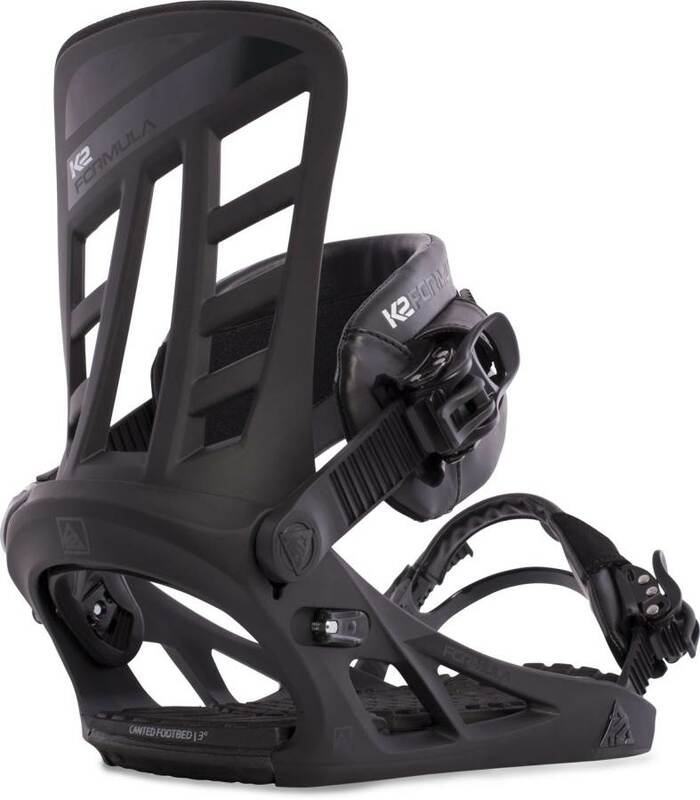 The next fix is they went from a small oval of EVA surrounded by hard plastic to more shock absorption that get’s closer to the Union Contact and most Burton bindings. 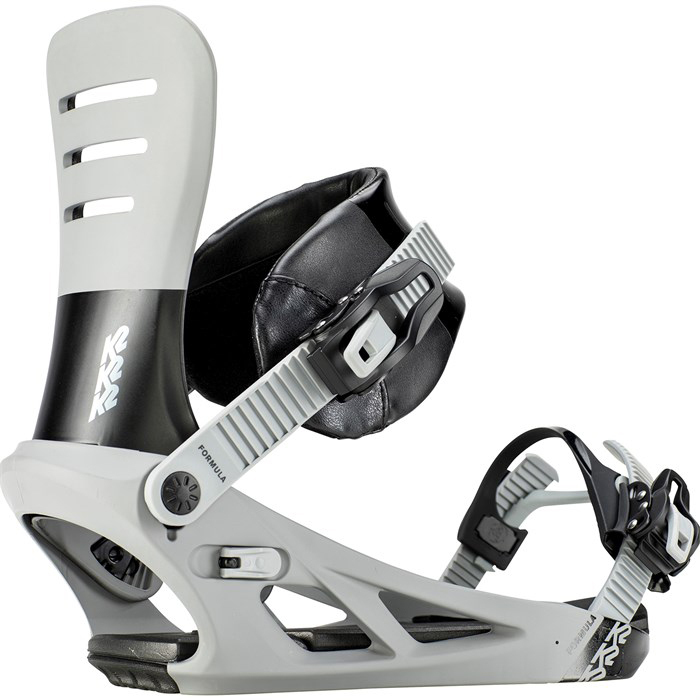 The entire base plate has EVA foam across it and a flap to cover the screws so it fits your foot better. 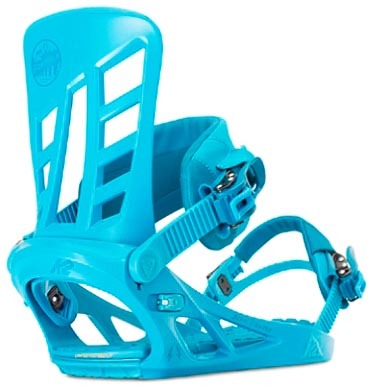 This seems to be the trend for every snowboard company so it’s not as unique as it use to be. The high backs are pretty aggressive. They also kept the same strap system from previous years which we applaud. The one thing we wish they kept was the 4 hole per side adjustment system for the high backs. The new models just have 3. So on the hill this binding doesn’t surprise you in any way. 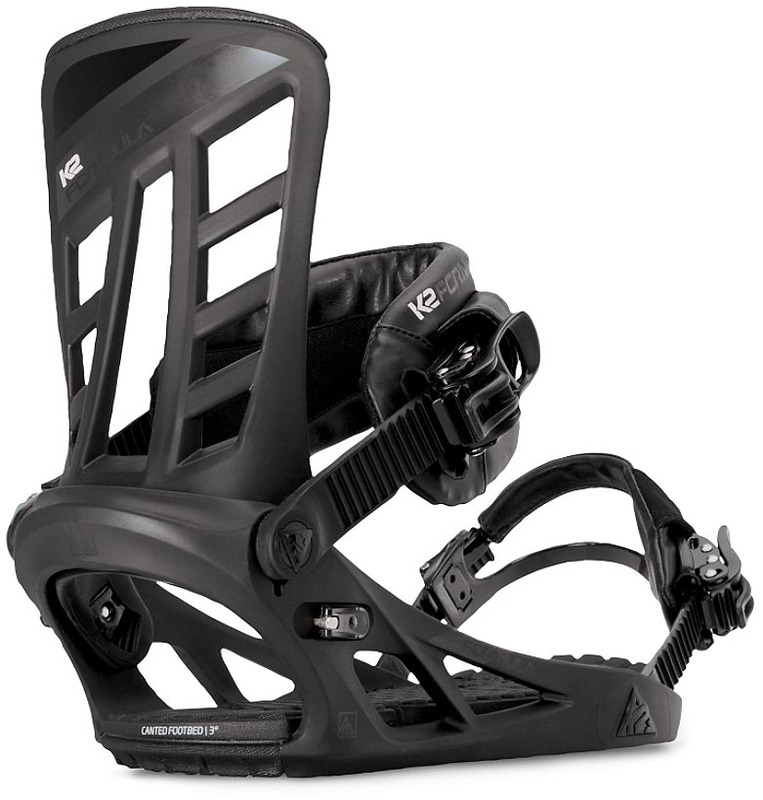 It is very predictable and rides like most bindings did a few years ago. We rode these bindings on 2 different boards. 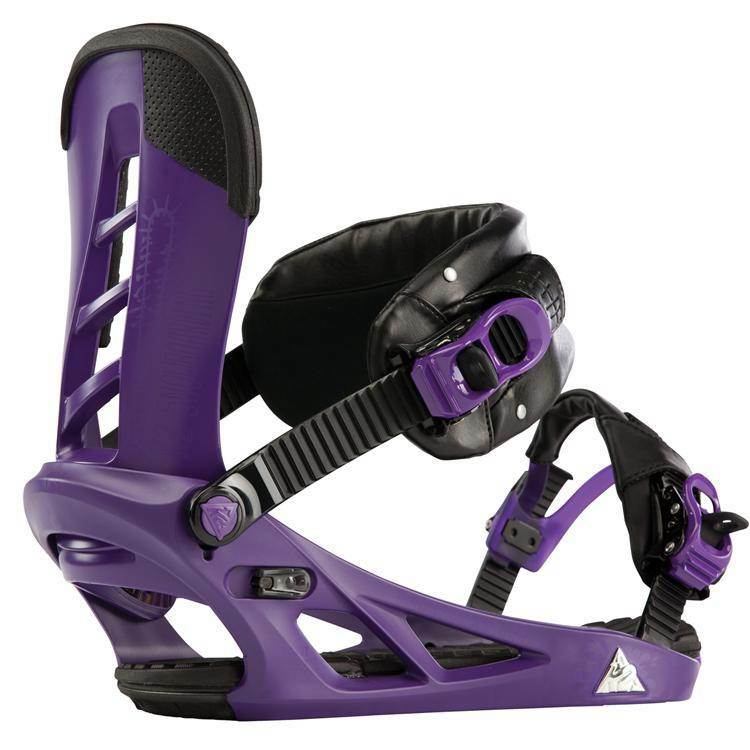 A freeride board and an all mountain freestyle board. Both boards we have tried many bindings on so we have a good idea of how they ride. 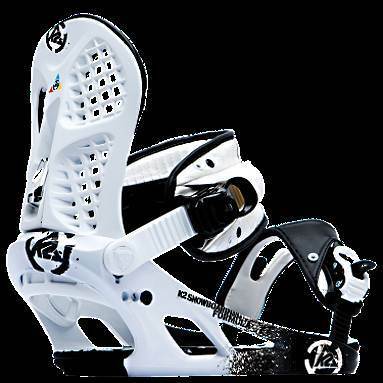 The K2 Formula’s rode rather flat and unresponsive compared to the Union, Rome, Flux and Burton Bindings we had on these boards before. Flat response is desirable for some but for most of us at the good ride we like a binding that takes less work to manipulate the board. Normally we like an ankle strap of this size but it just didn’t conform to the way your forward flex works and caused some pressure points. It will probably go away over time but it would of been a little better to taper the size near the center of the binding. The toe strap was excellent. It works either way without any issues but we preferred it over the toe. 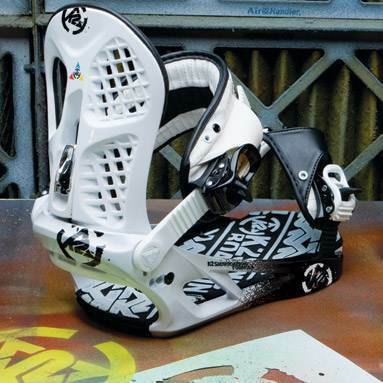 After our demo of these bindings we took them off to see a lot more than your usual marks on the board. 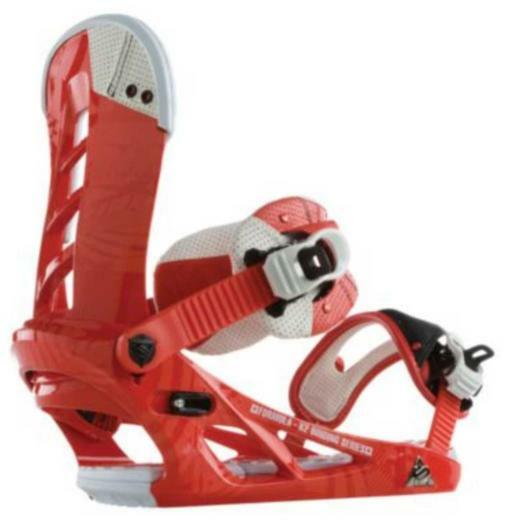 It was very frustrating compared to union and Burton EST bindings. 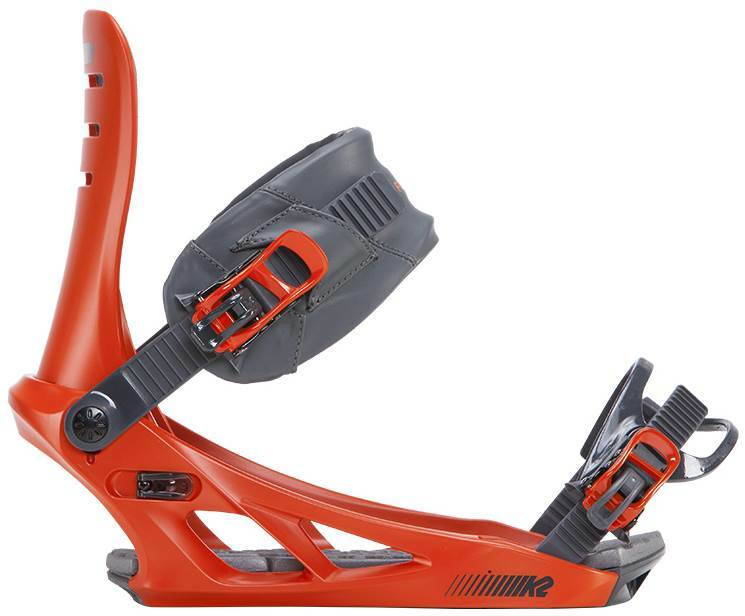 Those 2 bindings leave minimal impact. 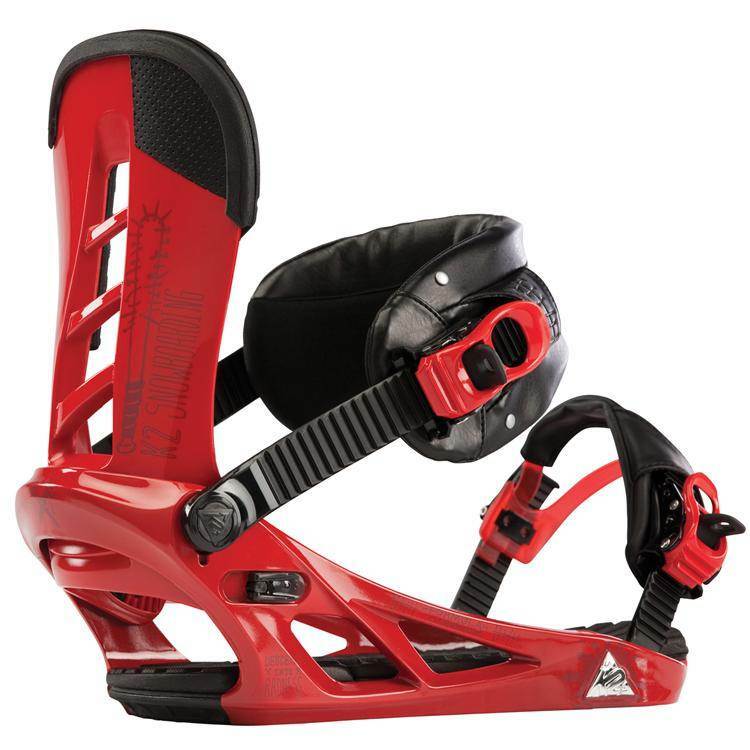 All in all this binding would not be something we would like to add to our quiver but it seems to be a good binding if you can find it on sale at the end of the season. We feel K2 has wasted too much time trying to make an easy entry binding instead of working on better turn initiation. 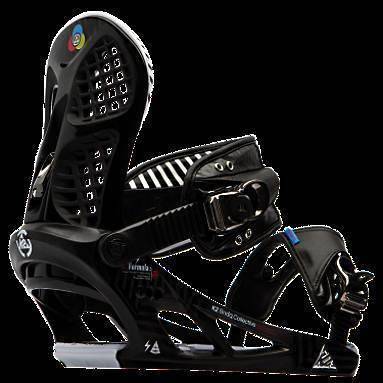 This is one of the only traditional bindings they have left and even though they made some changes it still needs some work. If you like the old school feeling where you have to work more for your turns and you have a very tough top sheet then this might be an option. These have excellent ratchets and very comfortable straps. When we started getting them set up and that is when some frustration set in. The first thing is the base plates have a different washer and screw set up that just isn’t as easy to get set up. The washers will be difficult to replace if you loose them where almost every other binding has similar washers so you can go to a shop and get new ones. Also the gas pedal adjustment was not that easy to set up either. It has 2 little pegs you have to push down to adjust it. 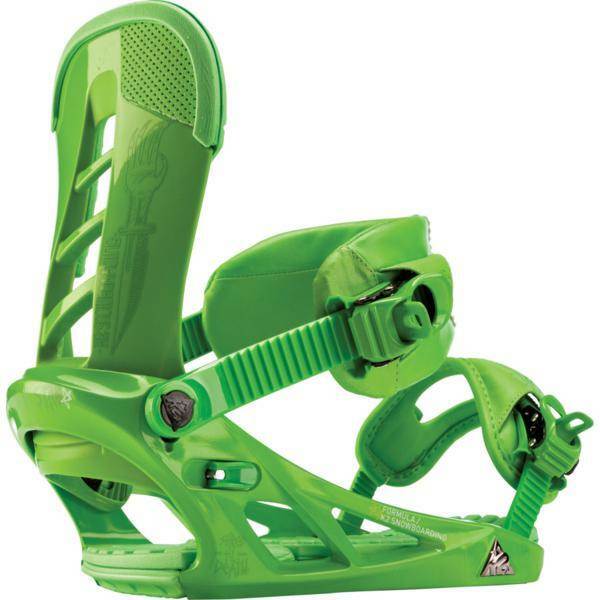 The biggest pisser was the Heel Loop for the older bindings. Instead of 2 screws like a lot of metal/plastic bindings have it has a screw bolt system in the front and a double Allen wrench set up in the front. You need 2 Allen wrenches to close it back up. This is just short bus! Why couldn’t they just put another screw in there???? 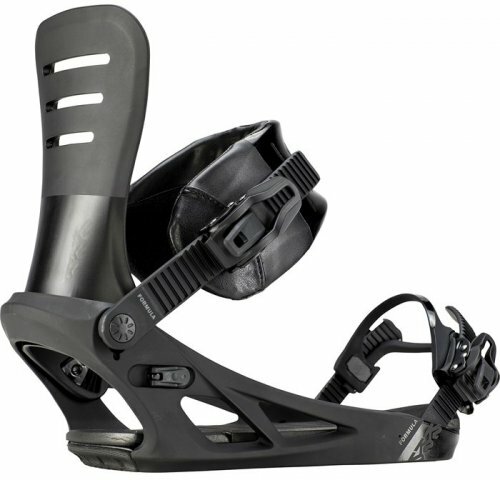 Our Bindings arrived at the smallest shoe setting so we had to adjust them in order for a size 8 and size 9 boot to fit. The entire base plate is made of very hard plastic/fiberglass and it is especially hard on the top sheet of your board. The one saving grace is the straps are very easy to adjust. you just flip this tab and they are ready to adjust. The high backs have 4 holes on each side where most have 3 so you can tweak your high backs to work with the angle you adjust them to.The one issue the old bindings had there is a very small oval hollowed out in the heel for more EVA foam where most heels these days are being completely removed and replaced with Rubber, Gel and EVA or sometimes all three. 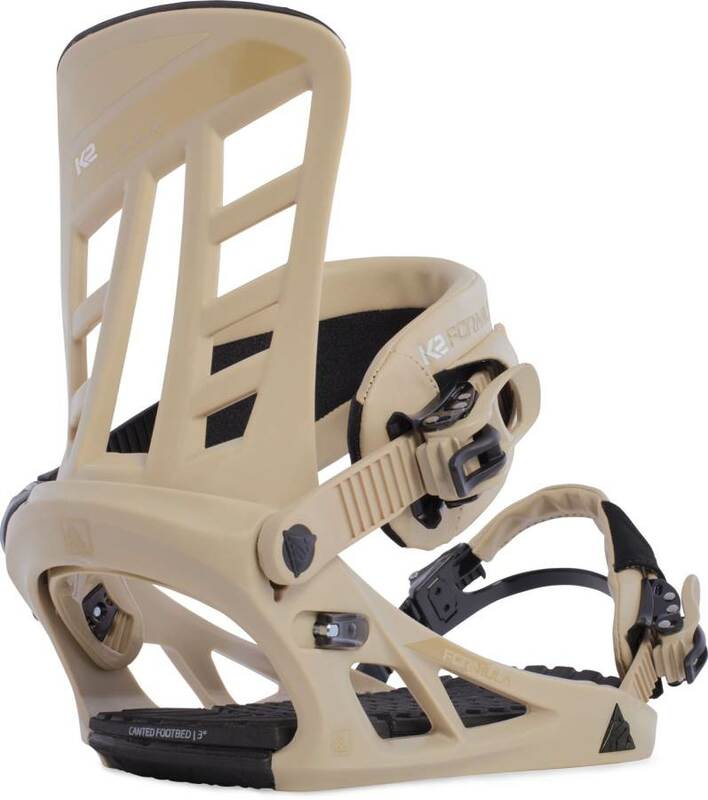 The majority of your boot will still hit the hard plastic a few millimeters below the EVA foam. The 2010 and 2011 K2 Formula models have improved greatly over the 2009 and below models so be careful what you buy. In 2011 the Formula worked more on what is important….performance. They added canted footbeds that work on making your ride a little easier on your body. They also added a new high back which has a better flex and response. We’d still like to see a little more shock absorption as well as more of the base hollowed out but its still not a bad choice. 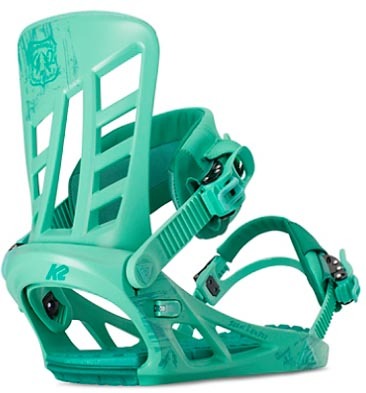 Not too much has changed from 2011 to 2012 and this is still one of our favorite K2 bindings. We try to get as many images of the K2 Formula, but forgive us if they're not all there.